In the computer peripheral category, one of the key tools for brand communication is product packaging. Kensington, a 25 year-old brand, looked dated and was losing shelf presence to more relevant products. There was a vast disconnect between the innovative products and the packaging that contained them. 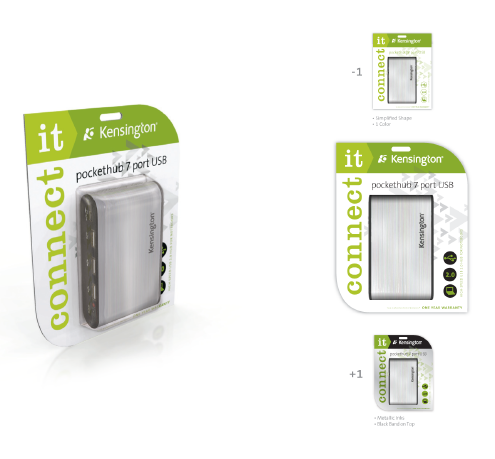 Although Kensington’s product line was quite extensive and stylish, the packaging was tired and uninspiring. An update of the brand to breathe new life into the packaging system to build stronger connections with their customers was needed. Key considerations in the design process included cost efﬁciency, creating a uniﬁed, ownable packaging system, and simplifying the product marketing message to make customers shopping experience effortless. Understand what Kensington stands for today and what it could achieve tomorrow. 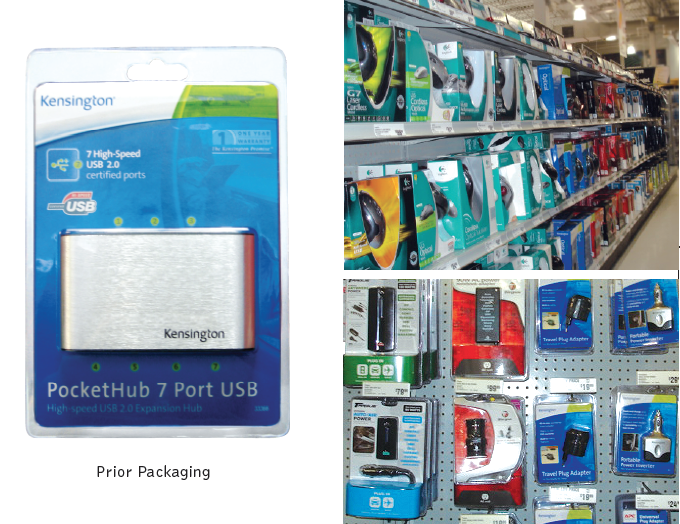 With the computer peripherals market becoming increasingly competitive, packaging can become a brand differentiator as well as one of the only decision making tools available for customers. Avoid the Middle. Retailers in the middle (undifferentiated brands) all posted losses in the last three years. Effective packaging aligns to customer’s lifestyle and aspirations. Authentic. Customers today seek out and connect with experiences that are real. Every experience has a narrative and meaning. Create Preference and Presence. Customers have awareness but no pull-through. Packaging should not only become a beacon for the brand but a contemplated choice. Customer First. 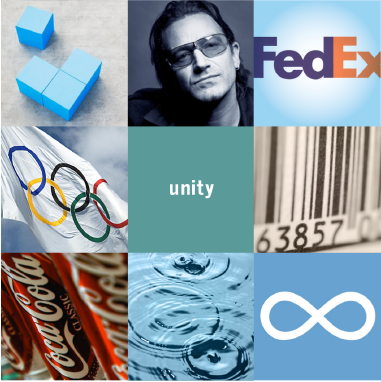 Use customer ideals to formulate packaging that is relevant to customers. Despite the success of a few major brands, the market is fragmented. Customers are not sure of the differences in products. The shelves are a mess and knowledgeable help is limited. 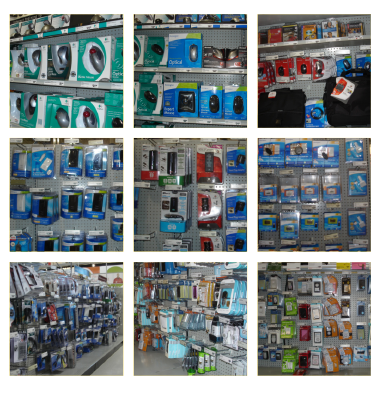 Most competitors create brand awareness through mass shelf presence. 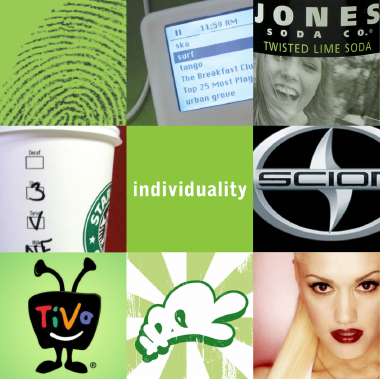 However, this space absorption does not necessarily gain you brand preference, only brand acknowledgement. 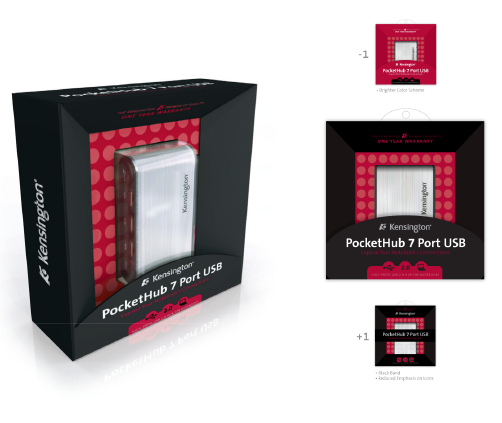 Brand Promise: To create smart, simple, innovative technology accessories that consistently deliver value and enable digital users to have positive, productive and enjoyable experiences. Cost: Packaging that does not increase costs over the entire product lifecycle. Environmentally Conscious: Emphasize recycled materials and reduce use of plastics. Maximize Structure: Limit amount of space used for shipping as well as optimize utilization for retailers. Easily scalable for majority of products. Customer Friendly: Easy to open, hierarchy of information easily readable, “why to buy” statements easily found and memorable. Ownable System: Create a unified line that 90% of product can use without redesigning packaging structures for each product. An in-depth audit of both the existing Kensington product line, as well as competitive packaging was undertaken investigating various retail environments in order to see ﬁrst-hand how the products were displayed and merchandised. 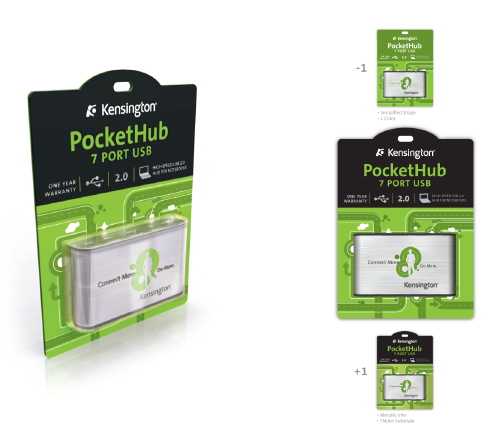 With research, demographic data, and customer insights, it was determined that Kensington should take a revolutionary approach with its new packaging. The category was seen by consumers as overwhelming and confusing. The new design needed to be “smart and simple”— innovative enough to stand out on the shelf, messaging relevant and authentic enough to speak to consumers’ needs and lifestyles. The old packaging relied primarily on bulky, plastic clamshell containers. Because of its cheap tactile feel, the plastic packaging was creating a low-end, common brand perception. To change this, a dramatic change in the structure and materials used to package Kensington’s product line was proposed. The initial concepting rounds included comprehensive studies on new packaging structures. Cost, shipping and display conﬁgurations, environmental sustainability, product presentation and customer interaction were all taken into consideration. Each direction was ﬁrst developed as a conceptual statement that supported the overall strategy in a unique way. A simple visual concept matrix was created to visually reference aspects of the concept. 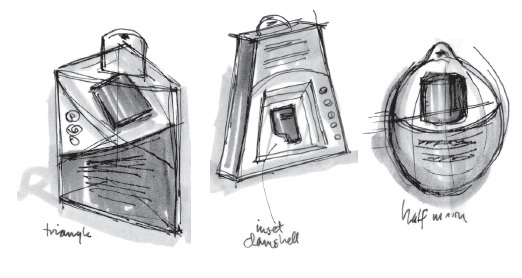 Sketches and design concepts were then created for all directions with variations created for upper and lower product tiers. The effectiveness of each was then measured against the original concept statement. Kensington makes products that are relevant to our lives. They allow us to fluidly move through work or play. They help keep us in motion, connected and in control. 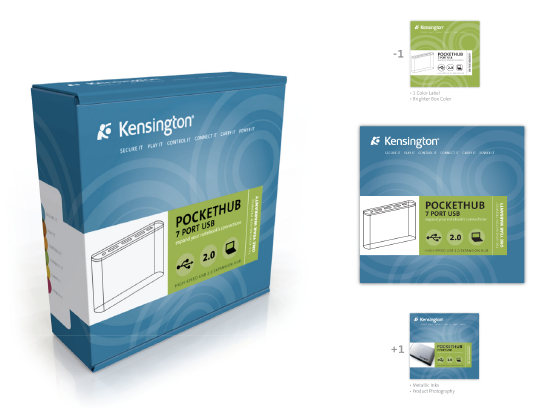 Kensington products are about making the connection between our lives and our technology better, faster and more enjoyable. Kensington makes products that are empowering. They extend capabilities and free us from limitations. Essentially, they energize us. The vibrant orange and dynamic, stylized “K” ray combined with the unique “n” shape all help create instant recognition to the customer and serves as a beacon amidst the shelf clutter. We all want it. We want to be able to connect, play and run better, faster — no matter where. Kensington helps us to do just that. Therefore, rather than organized by technical features, this direction is driven by the product’s functional attributes. Kensington is all about helping us do “it” no matter what or where that may be. 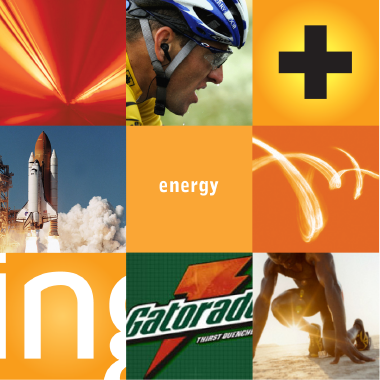 Kensington products have universal appeal in addition to universal application. Why not create a universal solution to the packaging? Contained within the modular square box lies an infinite variety of products. Efficient, effective and uncomplicated, just like the products.